The 2018 InfoComm Conference and Expo just wrapped up. It was another record year for InfoComm Vegas. This year, Let’s Do Video is again joining forces with David Danto (industry consultant and analyst) to bring you the InfoComm wrap up. David Danto will cover this year’s sessions, top level trends and partnerships at the show, while our own David Maldow will provide a detailed report of the exhibitors and offerings. This article is also available on David Danto’s webpage. Greetings from Las Vegas and InfoComm 2018. I stayed here an extra day after InfoComm ended this year to relax with my wife and some friends. I saw the Cirque do Soleil show “Love” for what had to be the fifth time (great show) and realized that one of the first times I saw it was as a guest of Crestron at precisely one of these InfoComm shows. 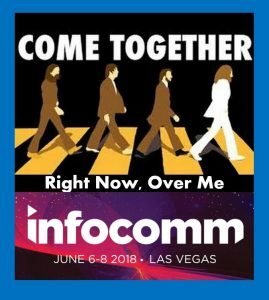 It also made me realize that the theme of this year’s InfoComm was clearly “come together” for multiple reasons. 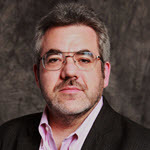 Firstly, as we did last year, David Maldow of Let’s Do Video and I are coming together to write our InfoComm wrap-up and coverage. We both had such a busy week here that we felt that two impressions of the event was the best way to cover it. And, uncharacteristically for us, it took us a number of days to rest and recover enough to get it out. I am covering the high-level themes here, and (as I spent most of my time coordinating sessions) David Maldow will give you a run-down of the exhibits he saw. We’re both contributing to each other’s parts as well, but at a high-level, that’s how we split it up. However, the come together theme was about way more than just us. 45 thousand or so people in the industry came together at this conference to see, hear and chat about the things that bring us together – and occasionally – the things that tear us apart. Show me a family that always agrees on everything and I’ll point-out that it’s a sit-com or a fantasy. At InfoComm we have AV integrators, IT integrators, manufacturers, service providers, end-users all coming together under one big tent. Each has a different perspective, and most share theirs openly and loudly, hoping to move our industry forward. This energy was extremely evident at the conference this year, with more activity on the expo floor, more attendees at the educational sessions, and more input from the varying perspectives. From all my conversations and what I’ve read on-line and in the Twittersphere, while some disagree about AVIXA’s new direction with ‘experiences,’ some felt the integrators were being left behind, some felt the push into new areas with Tide was “elitist,” and some felt the technologies being focused upon aren’t growing in-sync with the real world – we all came to the event. We all networked, laughed, ate, hugged, asked serous questions, cheered and shared our thoughts under one big tent. Viva la difference! I am proud that my work with the not-for-profit IMCCA was one of the driving forces behind coming together as well. 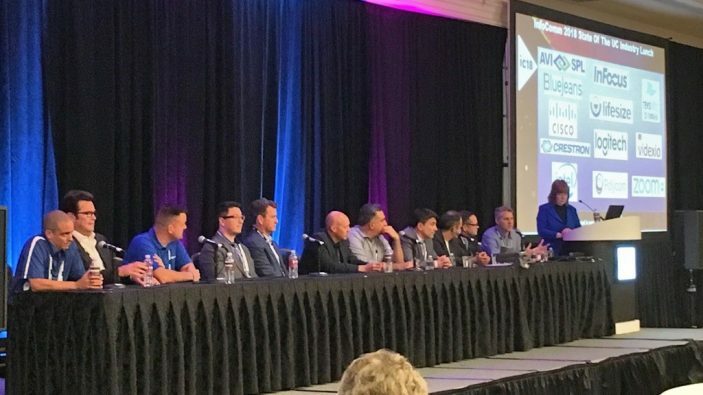 This was the first event that I know of that featured educational sessions presented by AV experts, UC Analysts and experts, and CE Analysts and experts. This was our industry’s acknowledgment of ‘come together’ – that Consumerization is driving the AV and IT industries, forever changing how we collaborate and communicate. Our Emerging Trends day on the Tuesday before the show featured over six-hundred pre-registered attendees (and more if you include last minute drop-ins) that were eager to find out what our speakers felt were the most important trends to look out for. This year we had not one but two speakers making urgent please to understand how the consumerization trend is affecting our space. In the morning, Pet Putman – long time InfoComm educator – covered how the trends he saw at CES and NAB would shake-up the professional AV space. 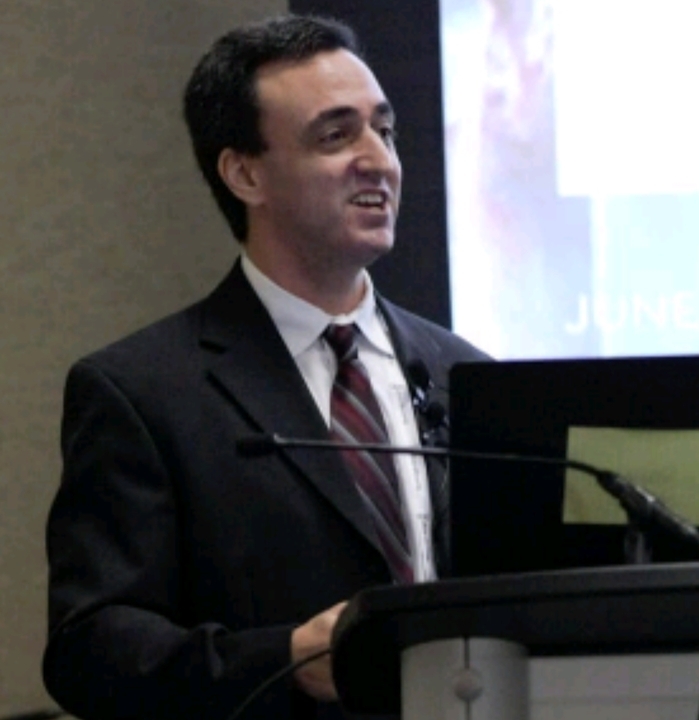 In the afternoon, The CTA’s Vice President of Research made sure attendees understood how Artificial Intelligence (AI) and robots would reshape consumers’ expectations for relationships with technologies. The other speakers covered topics including Smart Offices, Digital Signage, distribution of all these high-resolution video signals we’re creating, Live Experience Technology, the explosion of the Huddle Room paradigm, the revolution in Collaboration Camera technology, and the movement to AV as a service. Nine more undisputed experts in their field were honored as Emerging Technology Fellows, bringing to eighteen the number of people honored and recognized under this program. The Unified Communications session track also saw the coming together of experts discussing the hottest trends in collaboration. David Maldow was joined by Global Data’s Tim Banting and others to explain what’s going on in the Team Collaboration and general millennial workflow space. They made the point that this growing group will represent 50% of the general workforce by 2020, and organizations that don’t adapt their collaboration styles to meet their expectations will have a hard time filling open positions. Nemertes’ Irwin Lazar and Vyopta’s Jacob Borgeson explained how collaboration metrics have changed over the years, and how they now offer much better actionable insights for organizations to drive ROI on collaboration investments. I came together with Alexa, Siri and Google Home and others in my session on AI, explaining to those attending that voice control as an enterprise UI is much, much closer than most people think. Sure, there are still issues, but I and my panelists agreed that this is happening and we need to get ready for it ASAP. 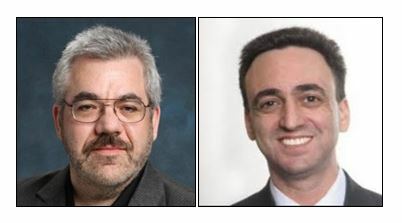 (See my related Viewpoint article from Sound and Communications IT/AV report here.) The entire UC track was the best attended ever at an InfoComm conference. 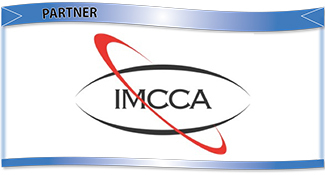 It was so popular in fact that the IMCCA has decided to produce most of the sessions as on-line webinars over the course of the year. Stand-by for more information on where to find the slides from this year’s presentations, and how to sign-up for the (free) webinars. Come together was also an appropriate perspective to take upon the realization that our industry is no longer just about the technology that drives the hardware and software. While that aspect is still important, the recent drive by the AVIXA team to have our industry expand its focus to include content awareness and the user experience is no less important. If our ultimate goal is to leave users with a satisfied feeling – whether that means wowed by a spectacle, or just supported by complex technology that felt ‘invisible’ – we have to examine and understand this aspect of our space. A much larger portion of InfoComm than in years past focused on content, design and the user experience. This is a change, and history has shown us that change is usually a difficult thing. Those of us that see the AV industry being absorbed (to some degree) as an IT specialty think that our focus should be on new processes and standards in line with an ITIL foundation. 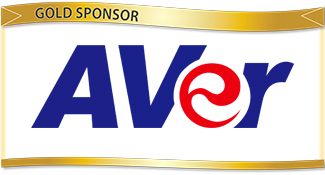 Still, there are people at the other extreme that see the change as embracing the end-user to the potential detriment of the legacy InfoComm/AVIXA membership (integrators and manufacturers.) None of these are heavy disagreements or ‘us against them’ situations. As in any family it’s ‘us against us,’ with the hope clearly being that we are all better-off as a result. We always come together, and we will still need to going forward if our industry is to thrive. Many of these points were echoed at the End-Users Speak Their Mind Lunch and learn on Thursday. Chris Neto and I came together to co-moderate a panel of enterprise AV Managers and AVNation-TV Stars to chat about the direction of our industry. The panelists had an engaging debate about many topics, including how to cope with the pressures of meeting end-user needs yet staying within some level of standardization at their organizations, incorporating some of the emerging technology yet staying within an organization’s compliance mandates, and obtaining their own end-users’ feedback without setting unreachable expectations for their user community. There were also a number of complaints about the quality of some of the exhibitors’ booth staff. “It seemed harder than ever to get a straight answer to a technology question at some of the booths” one panelist lamented. There was open speculation that some of the exhibitors resented the huge influx of end-users on the expo floor this year. While I don’t think that was true, all of the show attendees seemed sharper than in years past, and exhibitors are definitely going to have to up their game to keep the interest of the attendees. That lunch and learn followed Wednesday’s lunch session that included a dozen of the hottest firms in collaboration today giving their vision of where the industry was headed. It was a lively discussion about AI, the usability of technology, and future of collaboration. The biggest burn of the discussion was when an attendee asked why Microsoft and Google weren’t on the panel. While the actual reason was because they were not sponsors of the show’s UC pavilion, Zoom’s Dave Berman postulated that it was “because their video wasn’t very good.” When you bring together representatives of that many industry firms on one panel, sparks are always guaranteed to fly. And, regarding Polycom, I should also mention that InfoComm18 represents the firm’s final appearance as a stand-alone organization at an industry conference. Plantronics purchase of Polycom is expected to close sometime within the next month or so, representing the end of an era, and the beginning of a new one. I believe that both the Polycom and Plantronics brands will survive the merger (at least in the short run) and with great guys at the helm like Joe Burton and Bob Hagerty I feel very positive about where they are headed. Altia Systems’ Panacast 2 camera now has the ability to provide metrics regarding the number of occupants of a room – and the status and count of recognizable objects in a room. This data is not only useful for collaboration managers to understand utilization, but it can also be ported over to a security system to understand occupancy, status of gear and more. We’ve seen examples of this in codecs from large firms costing thousands of dollars, but never before in USB webcam. 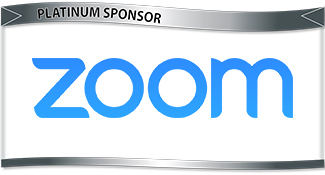 AISense’s Otter transcription technology is now available in Zoom videoconferences. This was one of many examples of smart voice services coming into video collaboration. Cisco’s “OK Webex” AI assistant for starting meetings was another. There are far too many vendors on the floor to include in a single article. I did my best to chat with as many of the key players, and exciting new entries in our space, as possible. 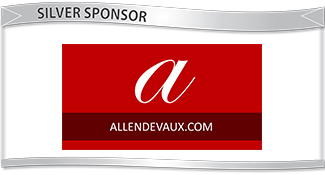 BlueJeans has completed it’s evolution from a technology partner, to an experience provider. By that, I mean when BlueJeans first hit the scene, its claim to fame was connecting disparate services. The very idea of calling into a Polycom/Cisco meeting room from a Skype client was absolutely revolutionary in the early days of BlueJeans. 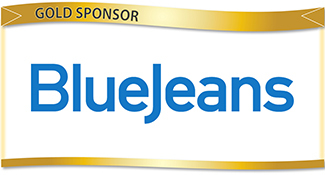 But there was no BlueJeans experience, they were simply the enabler in the middle. The experience was defined by the equipment and apps they were connecting. Times have changed and we now look to our software/virtual spaces to really define the experience, and for our physical room systems to compliment and enhance that experience. In other words, service providers need a cutting edge, 2018-ready, experience to win with users today. BlueJeans understands this and 90% of our discussion (and their current focus) was/is about user experience as a result. This goes from their new UI (full screen video, menus hidden, intuitive and clean), to their partnership with Dolby Labs. This “experience first” approach is proving to be a winner for BlueJeans, and they are doubling down on it. Of course, they are still working hard on the behind the scenes functionality and manageability for the IT folks. Please see my recent review of their Room Kit with the Dolby Conference Phone which focused on enterprise manageability for more information on that front. However, I expect the forward face of BlueJeans (and the industry as a whole) to focus on cool user experience improvements, like their wild hairdryer and shower videos showing the power of their Dolby background noise reduction capabilities. 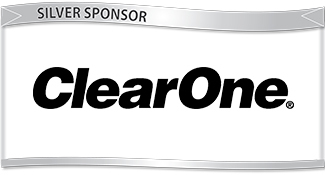 The ClearOne product line-up is reflecting our industry’s shift from communication to collaboration. Rather than simply continuing to sell great hardware peripherals, ClearOne has realized that the in-room equipment is only part of the solution. As a result, they have been offering bundles including their Spontania software solution with their hardware products. 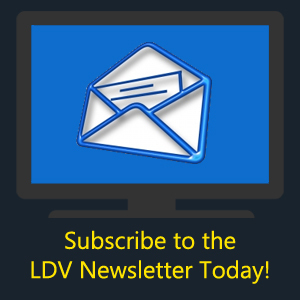 Please see our LDV Podcast on the Spontania solution. ClearOne has taken the next step in this direction with its new ClearOne Collaborate Share and Collaborate Space offerings. As you can see by these offerings, the focus isn’t mere communication, but true collaboration. Collaborate Share makes it easier for team members to share, and work on, materials in real time, while Collaborate Space supports our new Millennial “project based” workflow. The project doesn’t end when the meeting ends, and every bit of information and project work needs a home. Collaborate Space provides a central access point to all project work supported by ClearOne solutions. Strategically it makes great sense for Logitech to expand into larger rooms at this time. 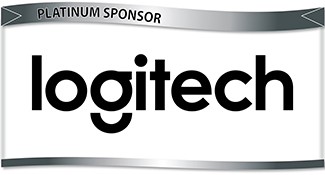 5 years ago, it would have been risky for an IT/AV person to recommend Logitech (then known for consumer goods) for a big, high visibility, conference room. We have pro-AV gear for those rooms! However, the success of the Logitech Group and MeetUp in the huddle space have established Logitech not only as a player, but as a leader, in enterprise videoconferencing peripherals. The market is ready for a higher end Logitech rig for bigger rooms and Rally hits all the marks. Hellene Garcia (Director, Business Development) brought me up to speed on the latest from StarLeaf. The company continues to cover all the bases. From leading integrations/interoperability in their Open Cloud solution, to the development of their own team messaging app, to hardware meeting room solutions, StarLeaf has an answer for business communication and collaboration. I think the new app is particularly interesting and well positioned to gain some traction. We have some team apps that come from the consumer space and need more enterprise security/manageability. We have some team apps that come from the enterprise space, but have audio and video bolted on in one way or another. StarLeaf’s app was built from the ground up to be fully enterprise ready, and it was built around their high quality, enterprise ready, video and audio cloud. I am looking forward to taking it through its paces soon. 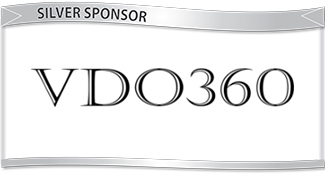 I got the latest scoop, and a ton of NDA development news, from Dan Freeman, Founder and CEO, and Mike Baker, VP Sales, of VDO360. The big news from this company is that they are now offering intelligent framing, on their affordable business quality videoconferencing cameras. In fact, they had raffles at the booth, giving away three of their top of the line cameras with this new feature. That really makes the point that this is shipping, and not just demo-ware. This new capability won them the Best New VC Accessory award at ISE this year. This company is known for affordable, high quality, cameras that generally push the latest feature sets. By making the framing automatic, VDO360 is taking their offerings to the next level. They also are seeing great success with their TeamCam model. It is really hard to match the capabilities of this camera at this price point. Definitely should be on your short list as you look to equip today’s huddle spaces. It’s always great to catch up with the team at Videxio. This year we sat down again with Tom-Eric Lia, CEO, Karl Hantho, President Americas, and Lindsey Baine, Marketing Manager Americas, to get a company update, and a sneak peak on what’s ahead. On the service side, they working closely with technology partner Pexip to offer interop with the new Microsoft Teams and now Google Hangouts Meet. 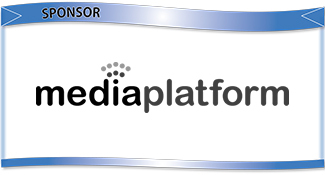 Videxio is also continuing to develop their platform, apps, and network. Perhaps just as interesting is how they are working to support their service provider partners. I attended their partner breakfast where they described their new partner support plan. Since Videxio isn’t sold directly, their marketing team faces an unusual problem of having to rely on their partners to market and resell their service. However, the Videxio team understands the service best and is in the best position to create marketing materials. Lindsey Baine has solved this problem by creating a complete set of marketing materials for Videxio partners. In other words, Videxio isn’t just empowering their partners to deliver a leading enterprise ready video cloud, they are providing “out of the box” marketing campaigns to help their partners sell the service. This is the kind of partnership today’s service providers really need to get momentum behind their white labeled offerings. Janelle Raney (Product Marketing) and I have the same conversation every time we chat. I mention a wild feature idea and she shows me that the Zoom developers have had it working for months. They have a surprising amount of new features and capabilities sitting on the shelf (all NDA, sorry). Why aren’t they all available? Because customers aren’t asking for them yet and Zoom doesn’t want to confuse/overwhelm customers just to show off flashy new stuff. However, when customers do want/need/demand something new, Zoom will have it ready to go. I’ve been saying for a while that when you choose a cloud service today, you aren’t choosing based on their current product, you are choosing based on the strength of their dev team. Zoom’s devs are simply ahead of the curve. For example, while everyone at InfoComm seemed to be first demoing their new fancy transcription services. I first saw Zoom demo it last September at Zoomtopia. Founder and CEO, Eric Yuan, recently won EY’s Entrepreneur of the Year Award, and his company’s success is undeniable. The leading hardware vendors are racing to offer Zoom integrations with their meeting room devices. Personally, I still can’t understand why the industry isn’t making a bigger deal about their digital signage capabilities (included free with the Zoom Room service). Am I missing something, or does it’s affordability and manageability change the digital signage game? Digital signage aside, the Zoom Room continues to be the centerpiece of Zoom’s enterprise strategy. Customers love the combination of consumer-like ease of use, with business quality experience and manageability. With today’s top peripheral vendors designing to support the Zoom Room, users should expect ever improving collaboration experiences. I’ve been a fan of the PanaCast solution since it was conceptual. When it first hit the market, it was one of very few alternatives to the traditional pan/tilt/zoom camera. Today there is a consensus in the industry that users do not like remote controls and we need an automated way to properly frame speakers during video meetings. Not only that, but it appears that the PanaCast approach in particular is being adapted (and thereby validated) by market competitors. The approach is to capture the entire room in ultra-high definition with a wide angle camera (or camera array), then digitally crop the image to provide the best experience for remote viewers based on what is happening in the room. This allows the solution to not only frame speaking participants, but follow them as they move around the room. The solution is so smart, it can now even detect if there is a whiteboard in the room, and pop its image into a new window during a video meeting. This allows remote participants to put video meeting on one monitor, and the close up of the whiteboard on another. This was just one of the cool features being developed by President and CEO Aurangzeb Khan, who showed me their new Huddle Room Solution (kit including camera, NUC, speakerphone and keyboard), as well as some futuristic virtual reality applications. The integration giant is continuing to grow and find new successes. Their booth was constantly busy, showing demos of their Symphony Management Platform, and discussing their growing global coverage. As the industry continues to shift from reselling products, to enabling workflows, we look towards AVI-SPL for leadership in the integrator community. I spoke with several AVI-SPL team member and plan on following up to learn more about their developing VMR and cloud services strategy. The Barco booth had a lot of buzz around their UniSee wall. We all love big multi-panel walls, but we don’t like squeezing behind them to service them, and we hate aligning them! The UniSee wall can be serviced from the front, and the panels align themselves. It also looks stunning. Overall this was a great show for Barco, winning three awards for UniSee. I recently wrote a piece for TechTarget about the essential elements of a huddle space. I argued that the need for various collaboration tools depends upon the workflow of the teams using the space. However, every team workspace needs power. The first thing people do when they settle in to work in a huddle space is to charge up their devices. Belkin has a great name for quality chargers and adapters in the consumer space, and I expect their business facing offerings will be very welcome in our market. I particularly love the wireless charging, although many of us on older phones will still need the wired options for now. The big rebrand from Spark everything to Webex everything is in full effect. Customers and partners seem to be welcoming the change as it simplifies things from a marketing perspective. I think the real proof will be in the pudding. It is getting harder and harder to make enterprise sales based on the strength of your existing brand name and offerings. People are looking for viral experiences. In other words, they will always be able to sell Webex, simply because it has the name Webex and they have the name Cisco. But to really dominate, they better hope the new Webex Meeting experience is a hit with users. The game has changed and users now have the power to demand that their IT/AV teams support the tools they want to use. 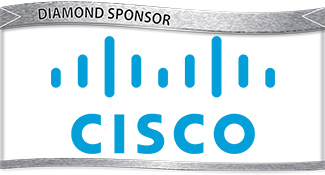 If users love the new Webex Meetings, then Cisco is going to have good times ahead. The same applies to Webex Teams, which should also get a look and feel refresh along the lines of Webex Meetings. The audio gurus from my youth are finding themselves quite welcome in the enterprise collaboration space. Their partnership with BlueJeans has been a great success for both companies, and Dolby is now expanding by offering a “Dolby Voice Room” hardware kit including their own camera, which ready for integration with not only BlueJeans, but other cloud video partners. The new system does an excellent job of intelligently framing the meeting participants (a big trend this year) and has some cool advanced features, like the ability to find and “unskew” a whiteboard on a meeting room wall. Perhaps most importantly, they are working closely with cloud partners to create custom UIs on the speakerphone display to accommodate each service’s workflow. This gives their software partners the power to customize the meeting experience to match their customers expectations. 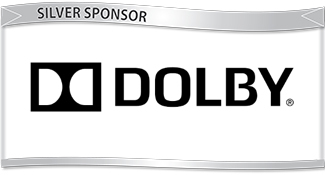 I expect more partnerships for Dolby and I expect to see a lot more Dolby Voice Room kits showing up in our enterprise meeting spaces. 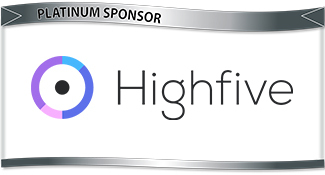 Speaking of Dolby partners, Highfive has been enjoying a lot of success ever since upgrading their audio with Dolby. The Highfive team is one of the first partners to leverage the Dolby Voice Room and demoed their custom UI for the device. This high end device, coupled with the easy workflow and usability of the Highfive service, is going to make a lot of customers happy. HRT announced the release of version 2.0 of their Huddle Hub offering. One of the many enhancements is that now a single Huddle Hub One unit will allow up to 4 concurrent independent sessions. Each session supports up to 64 participants and up to 4 screens presented at the same time. Version 2.0 also provides wireless camera and audio input by connecting your USB webcam/audio directly to the Huddle Hub One. The result is true wireless AV a unique team workflow for your huddle spaces. Huddly had a massive booth for a relatively new company in the space, and they absolutely needed it. Even on the last day of the show, the space was absolutely packed by people trying to understand the massive buzz around this company and its offerings. What it really comes down to is the fact that we are finally understanding the potential value of “smart” cameras and the Huddly is an extremely smart camera. At the booth they had a demo where the camera was pointed at the crowd and software was identifying people and objects. It was circling and labeling various objects. Now, we have seen demos like this before, but with software running on a PC. This was all being done inside the camera. When we talk about IoT and intelligence “at the edge”, this is exactly what we are talking about. Another power feature is the ability to capture and send three streams from a single camera. While the applications for this are still being developed, it is this kind of capability which is attracting top tier partners like Google. In fact, I saw a LOT of Huddly cameras at various booths on the show floor. While the magic secret sauce of this camera may be a little over the head of the typical user, the software video community gets it and is already working to leverage it. With a newer, smarter, Huddly camera being released, we can expect to hear a lot more from them this year. If you really break it down, in-room collaboration has two essential elements. A big screen to display content, and a way to get the content up on that screen. InFocus split their booth into two areas to cover these two needs. On the display side they had their video wall solutions, and on the content side they had their new SimpleShare product. Tim Albright at AVNation breaks it down in this video interview. I love homegrown solutions designed to solve an internal problem. It’s one thing when a vendor creates a new solution because they hope the world will want it someday. It’s another thing when a vendor creates a solution because they need it today! Intel had an immediate need for better internal collaboration. Designing the chips that make everything work isn’t a one person job. To improve their internal collaboration they created Intel Unite. After seeing massive internal adoption and success they have decided to share this solution with the world. At InfoComm they announced 7 partners, integrating Intel Unite into room hardware solution in various configurations. At InfoComm I presented on the topic of AV as a Service. Kramer is clearly on board the concept of delivering a lot more than “boxes”. Customers aren’t looking for a basket of tools to cobble together themselves, they want a comprehensive platform to cover their room collaboration needs. Kramer is evolving from a hardware company, to a software platform company, to meet these new demands. This was a cool new offering in the innovation showcase area of the event hall. While there is no shortage of screen share solutions on the floor, most of them are one directional. You can share from your device to the big touch screen, but you can’t control what you share from that screen. Layer Logic actually lets you leverage the touch ability of your touch screen and control your shared apps. In today’s collaborate spaces, we don’t just bring our devices, we bring our apps, and we want to be able to work with them. I look forward to following up with this company to see how the market takes to their approach. Legrand had a massive booth. I saw gear from Chief, Da-Lite, Middle Atlantic, and Vaddio. While each individual sub-company had cool new gear, the their combined power under Legrand can really help customers get everything they need quickly under one umbrella. Lifesize is taking an interesting approach to the huddle space concept with their new Lifesize Dash for “mini spaces” that need to be video enabled. Think of almost phone-booth sized spaces for private video calls. For these mini spaces we want something even more affordable than a huddle kit, but we still want enterprise quality video. They also demoed the new Lifesize Share device so their customers can get in on the wireless share workflow. 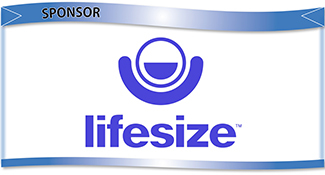 Lifesize continues to develop their cloud platform and gain customers, so I will be sure to follow up with them soon. “Is there anything cool on the floor that I need to see before the show ends?” The Nureva booth is always a safe bet. What started as a digital sticky note concept a few years ago has expanded to cover other essential elements of team collaboration. They first went beyond the Nureva board itself by developing collaboration software allowing remote team members to join in the working session. They then expanded into audio, which is another crucial element of team collaboration. At the show this year they updates to all three with a brand new board/wall, new features in their “Span Workspace” collaboration software, and intelligent sound tracking for their HDL300 speakerbar (now available as a dual speakerbar solution). They had a great demo of their sound capabilities as I called into a room with a dual HDL300 solution. The remote participants were walking around the room, and regardless of which way they were facing, or how they moved between the mics, their voices stayed clear and at the same volume, as if they were wearing a mic. Chatting with Jordan Owens (VP, Americas) of Pexip, it soon became clear that they are in an enviable position. Their tight relationship with Microsoft means that they tend to get out early with new integrations to MS services (like Skype and Teams). More importantly, the relationship protects them against the whims of Microsoft. Since they are official partners and certified, Microsoft isn’t going to make changes and pull the rug out from them. If that wasn’t enough, they now have a similar relationship with Google. 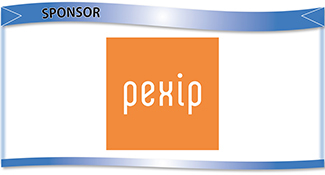 Despite the fact that Pexip is sold through partners, it has become a very well known name in the industry. 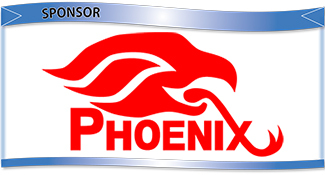 Their partners are now finding marketing value in advertising that their services are powered by Pexip. It’s great to see Pexip enjoying this success. Their entry into the space a few years ago as a pure software offering was new, bold, and risky. Fortunately, the market was ready for the approach and we can now enjoy the benefits of massively scale-able software video. The Polycom Trio continues to be one of the hottest devices in our industry. The history of the Polycom conference phone, along with the sleek design and functionality of the Trio, made it an almost guaranteed winner from day one. Our software service vendors are well aware of this and banging on Polycom’s door to integrate their services with the Trio. The market loves the software meeting room kit, and the idea of a Trio based kit is a sure winner for any cloud service. Polycom also had a crowd around their Pano solution, which makes local screenshare easy for team collaboration. They have added to the functionality and connectivity of the Pano in response to early feedback to make it more accessible for their users. I was really pleased to see all of this development and activity, as sometimes companies put everything on hold during an acquisition. You really can’t stop moving in this industry or you will fall behind, so it is good to see that Polycom’s developers aren’t on hiatus. The Plantronics Habitat Soundscaping demo was one of the coolest things I saw at the show. While the big news is their acquisition of Polycom, the Habitat solution is worth taking a look at. It solves the open office problem of background noise. It isn’t just that background noise in general is distracting, in open offices we overhear each others’ conversations and our minds are trained to try and focus and understand these conversations. It’s hard to tune out when other people are talking. The Habitat solution actively listens to the noise in the environment and plays soothing water sounds where needed. Sounds simple, but there was really a lot of engineering behind it and nuance to its application. You have to see the demo to truly get it. I look forward to seeing more futuristic soundscaped workspaces. Prysm is always showing off leading display technology and this show was no different. It’s new 6k display got a lot of attention on the show floor. Of course, the real power is when the displays are combined with their digital workplace software. In today’s market, the hardware (even amazing hardware) is merely a conduit for our software workflow solutions. Prysm’s solution is designed to support a high end collaborate “in-room” experience on their displays, while also supporting remote team members contributing to the project. The new SDW 5000 headset from Sennheiser is ideal for my workflow. I want a wireless device so I can get up and get coffee during a meeting. I want a charging stand so I don’t have to fuddle with cables. I want it to work for all my desktop video apps, and I want it to connect to my iPhone. Finally, I don’t want something inside my ear. I really like the three “wearing styles” of this device (headband, ear hook, neckband) and can see myself using all three for different situations. Honestly, if I could have walked out of InfoComm with any one item from the showfloor for my own personal use, it would probably be this. I’ve been following Synergy SKY for some time and they continue to round out their cloud offerings for their service provider partners. Originally, I knew them as an analytics service, but since then they have added management services, a calendar integration for quick meeting join, and now the ability to control ongoing videoconferences. These offerings are Synergy Analyze, Synergy Manage, Synergy Join, and Synergy Control. As we expand into larger and larger enterprise deployments, these features will become increasingly crucial. Revolabs is now Yamaha UC and they are enjoying great success with their first major Yamaha branded entry in the market, the Yamaha CS-700. Revolabs has always been known for high quality, enterprise ready, gear. However, their developers told me they had an entirely new set of QA to meet in order to wear the Yamaha brand. Their newest offerings, including the powerful YAI-1, which I saw in action at the booth, are designed and made to the highest standards. This new entry to our space fits into the “why didn’t I think of that?” category. The market loves our cloud vendor’s room kit solutions. If you have a software room kit set up from Vendor A, then your monitor will have a great list of all the meetings in the calendar using the Vendor A service, allowing for easy one click join. But what if your huddle space is shared by various working teams using different services? If your accounting team is on Skype and your marketing team is on Google Meet, what do you do? You don’t want two kits (or more) in each room. ZiipRoom solves this problem by simply offering a UI listing all video meetings on the calendar, regardless of which cloud service is being used. The UI can allow you to one-click join a Skype meeting at 1pm and a Google Meet at 2pm and any other vendor at 3pm. This should really help out IT/AV folks looking to set up shared huddle spaces for multiple teams.